Offers myriad features like personalized medical profiles of each patient, medical history of patients to ensure a smooth functioning between the doctor and the patients. 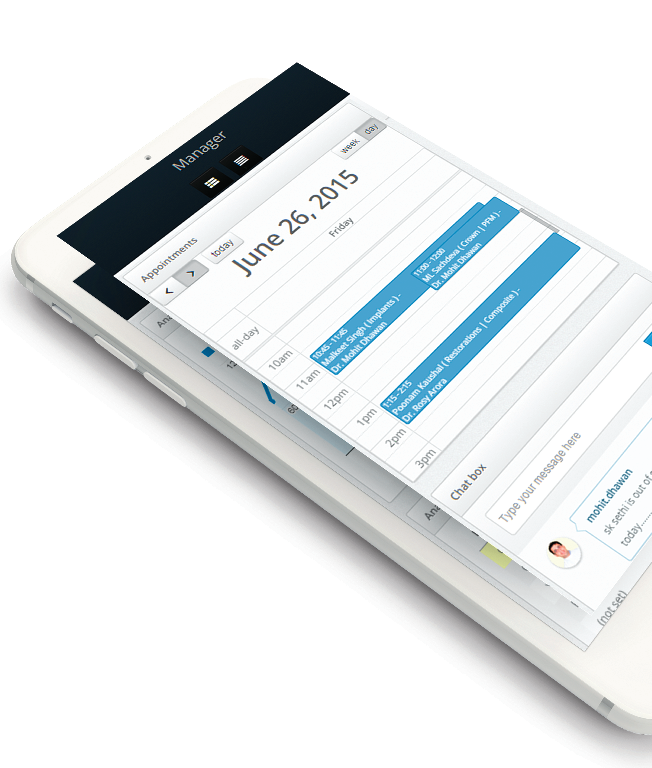 A feature where in a Doctor can view the booked appointments on his Calendar. Helps in managing patients and ensuring no patient is unattended. Automated acknowledgement email/SMS alert that will not only notify the patient of her/his next appointment but also provide them with the information about post operative instructions. -inSync is exceptionally well designed and user friendly so that the Doctors can access it on their mobile phones as well. Gives an adequate idea of people who have visited your online website with the assistance of Google analytics. 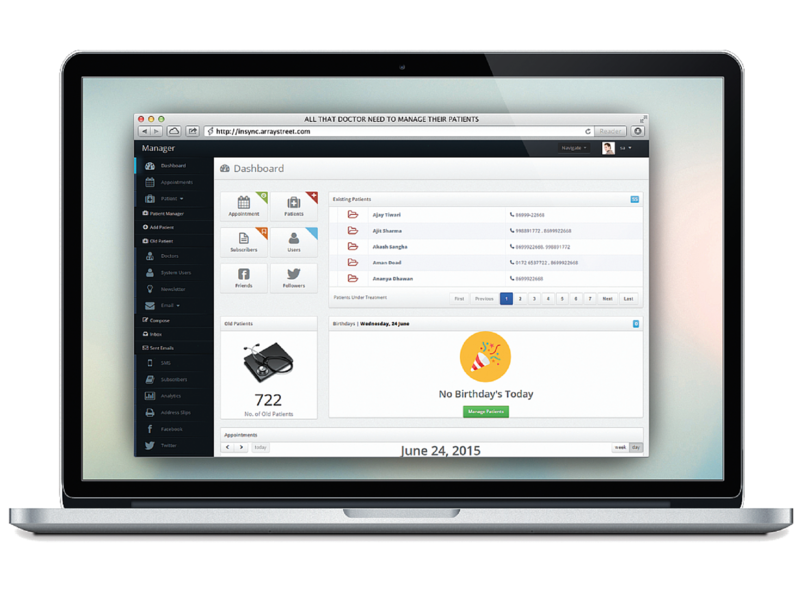 Schedule your patients next visit and get a complete view of daily/weekly patient visits right on your dashboard. With this inbuilt feature, you can send health related tips to your patients with just a few clicks, makes you stay connected with your patients. 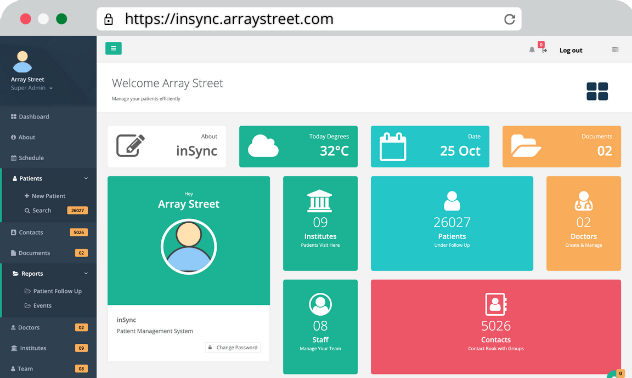 inSync is a premium management tool with flat design concept. It is a fully responsive management dashboard which means it can be accessed through different devices like desktops, laptops, tablets and mobiles. Integrated Google Calendar helps manage your routine. You can easily plan things as with this you get a complete view of what's next and who's next. If you are a doctor running a clinic or a group of doctors running a hospital, then this software will help you run smoothly without any hassles, seriously! You can make an account for as many doctors as you want. Want to convey a message to your reception silently? With the inbuilt chat feature you can chat with your team and convey a message easily. We utilize research, analytics, strategy development and technology implementation to add value to our services. Array Street is the place where we address real problems of managing business. We provide quality solutions to help utilize the resourcefulness of the web. We are a software house with experience in the latest web technologies. Our team fully analyzes before we put forward a solution that will enhance online business reputation thereby grow business.